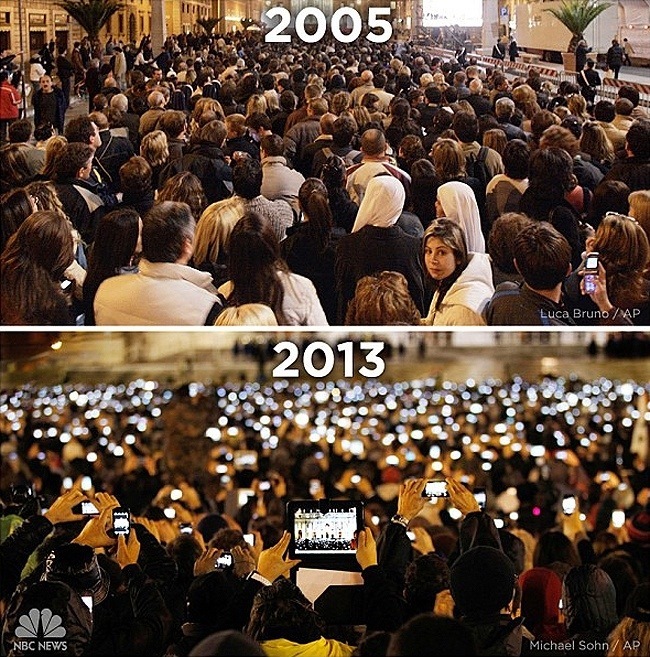 The technology juxtaposition photograph made famous by NBC on instagram highlights how far technology has come in 8 years. The 2005 announcement shows about 2 or 3 people either texting or taking a photo. The 2013 image shows a vast array of ipads, smart phones and digitial cameras. But it’s not the technology change thats interesting, to me its the speed of collaboration. To explain lets jump back another 8 years, and then another and then another. In 1981 our design process was either face to face via meetings or via letters or printed documents sent in the post. The speed of collaboration was 2-3 days. Jump ahead 8 years to 1989 and the fax was starting to be used in design offices. The majority of interaction was still face to face and printed documents, but now we could photocopy a proportion of the drawing mark up a change and then fax it to the architect or designer. The speed of collaboration was shortened to 2-3 hours. The advent of email meant that the speed of collaboration was shortened to 2-3 minutes through domestic scale data connections in 1997. The process was similar to faxing, photocopy, mark up and then scan and email. But the majority of verbal interaction was still face to face or over the landline, delaying collaboration until someone returned to the office and received a message to return someones call. In the year of the first photo of the pope announcement image, 2005, we saw a big jump in the speed of verbal collaboration. Email and face to face was still dominant for collaboration but the speed of verbal collaboration was accelerated by the mobile phone, we were now connected to our work 24 hours a day anywhere in the world. In the final year of the photo, 2013, the speed of collaboration has accelerated at an enormous rate. Google Docs allows us to collaborate real time on documents, desktop sharing is now common place. Ipads allow us to receive emails, mark up drawings or pdfs and email them straight back – no need to be ‘in’ and office to print off, mark up, scan and email back. So the interesting aspect of the juxtaposition of the photos isnt the technology itself, its the impact of the technology on the speed of collaboration. The person holding the ipad could be using facetime to show a particular construction detail that needs to be resolved in a building, while a team ‘in’ the office maybe calculating how to resolve the issue – all in real time. In 8 years we have gone from needing to be ‘hard’ connected to collaborate on designs to now being able to collaborate on a design from anywhere where you can get a 3G data speed. The delay time in collaboration has shortened dramatically. What will the next 8 years do to the speed of collaboration? And more importantly what will we do with it?